Once in a while a game comes along to blow away all your expectations, a game that steps forward and makes even the die-hard opposition fan boy question his/her loyalty and secretly hope that there chosen console may one day have an epic title of that magnitude on their books. Ask most gamers about the N64 and I’m sure within their top 3 games Golden Eye will rank, and at that point their eyes will glaze over as they remember a long forgotten battle fought out over the railing on the stack level in multiplayer with the radar turned off and weapons set to pistols. I’ll never forget the intro to that game, the first few minutes which mimicked a Hollywood blockbuster perfectly, seeing bond enter from the right of the screen only to turn on the spot and shoot the awaiting player head on just like the start of the movies. At that point I’d played a lot of movie tie-ins but I had a feeling that this one was of a different breed and for once in my life I was right. Right from the off the game boasted four internal save spots displayed as files and a target to select which file to use. Ask any true Goldeneyer’ which file they used and there probably tell you they picked the second from the left as it meant you didn’t have to move the target to a location and therefore could access the levels quicker. After picking your save slot levels would then be displayed in a filmstrip which would only display the level you were up to and the levels you’ve completed. Starting in a ventilation shaft on the facility level and giving one to the head of an unsuspecting guy using the toilet. Wondering if the tank was drivable… which it was! And trying to complete objectives to unlock cheats whilst keeping a constant eye on a stop watch I had. Enemies show up in the oddest places. The un-lockable cheats didn’t really feel like cheats and never ruined the game, they had to be earned, some more easily than others but even after earning them they could only be used on levels in which you had already completed all objectives. With a weapons and character list to die for, sound effects that where crystal clear and ‘real life’ looking faces this gem really did ooze greatness and amazing detail from start to finish. But once all the levels where finished and the cheats unlocked was there anything left apart from an empty shell? The multiplayer, this is where the game really cemented itself into gaming history, the options for multiplayer included an array of characters, different game styles and time lengths, a wide selection of guns and mines and a choice of some fine levels. Hours could be lost between you and a few mates crowded round the grey box arguing which levels were the best and who had the best shot. If you were around when this game hit the shelves and you’ve played the multiplayer levels with a few close buds then you should feel the warmth still in your hearts for what can only be described as the ultimate fps for the n64. As for today’s run and guns… they just don’t seem to have the charm. I take issue with the description of Goldeneye as “the ultimate fps for the n64” – but only because it was followed by Perfect Dark, which in the multiplayer features many of Goldeneye’s weapons, a fair number of Goldeneye’s levels, and a far wider variety of characters and weapons from Perfect Dark itself. PD was basically Goldeneye II – same developers, improved engine, and a focus on making the multiplayer component as good as it could possibly be. I see your point however I guess it’s more about the impact a game leaves on you when we talk about retro videogames. When reviewing the game and making that comment I wasn’t talking from a technical stance as that would be pointless, though I will agree the graphics are better, yes there are a wider variety of characters (without as much depth as the characters form the film) and improved engine…. but that’s not the things that stick in my mind. It’s the sheer shock of seeing golden eye for the first time, the joy of seeing the game come to life before you. When I look back at a game I look at everything to do with the game; the box, advertisement, loading times, hours played, jaw dropping moments etc. From a technical point maybe it’s not the ultimate in graphics or engine, but the fact still stands that this game for the first time had it all… so much so the squeal had to borrow from it. Did perfect dark blow you away the first time you played it? 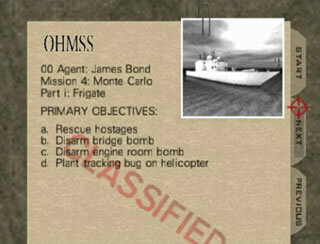 or did you just note down the improvements on golden eye? It’s the ultimate fps for the n64 not because of it’s characters, levels or engine but because it was milestone and it much to annoyance of playstation owners it was for nintendo owners only. But each to their own though, thanks for reading the article… I’ll be watching my statements in the future. The multiplayer’s enjoyable to this day. Played it at a barcade recently with friends, still incredible. Best match was nothing but proximity mines everywhere.